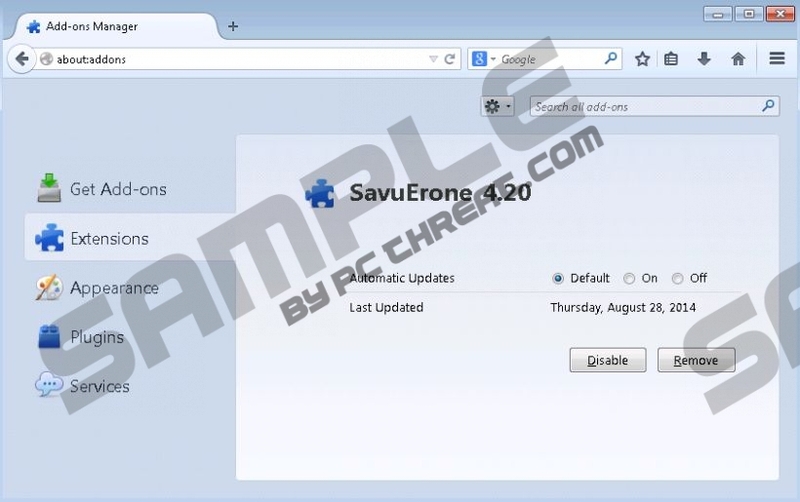 Savuerone is the alias name of the infamous advertisement-supported program SaverON. This devious program has tens, possibly even hundreds or alias names which are meant to trick automatic malware removal software about the necessary Savuerone removal, and create obstacles for computer users researching the suspicious application. Even though in some cases it may be difficult to disclose and delete the clandestine program which we identify as an infection, you should not give up until you succeed. Some malware researchers delete Savuerone as a name randomizer, and clearly this is due to the fact that the program can be presented using different name variations. Unfortunately, this is not the only infection of this kind. GreatSaving, WowCoupon, ShopNDrop, DealsFactor, and plenty of other adware are represented in the same manner. Our malware experts have analyzed these infections in the past, which is why they are familiar with the activity of Savuerone, and the removal of this clandestine threat. Just like the clone applications, Savuerone is distributed using third-party installers such as Installrex or Vittalia. What is unusual about these installers is that they are represented using fictitious suggestions. The download links leading to them may offer the updates of Java, Flash, web browsers, and other legit software. Of course, the offers are fictitious. What is even more disturbing is that these installers can bundle Savuerone with other undesirable, possibly unreliable software. In the worst case, you may need to delete Savuerone alongside other adware, tracking cookies, and other suspicious software. Even though the additionally installed malware may be more disturbing and may require more of your attention, it is necessary to handle Savuerone with care, especially when it comes to online adverts. Do NOT click on the displayed advertisements because you could accidentally install malware, expose your personal information to schemers, or get yourself involved in phishing scams without any notice. It is a must to disable such threats, and so you should remove Savuerone right away. Savuerone removal is not a straightforward operation. Many think that it is enough to uninstall the program (see guides below) to ensure that the removal is completed. Unfortunately, manual removal is not always the best option because certain files may be left behind. Unless you know how to delete Savuerone files manually and ensure reliable Windows protection, you should employ automatic malware removal software. Do not be scared to invest your money in your own virtual security. Click the Start menu icon on the left of the Task Bar. Select Control Panel for more options. To open the Start menu click the Windows icon on the Task Bar. Go to Uninstall a program and right-click the one you would like to delete. Access the Metro UI menu screen (tap the Windows key) and right-click. Select All apps for the Apps menu and open the Control Panel. Quick & tested solution for Savuerone removal.